This year marked Courtney's final year in school as she will graduate this month. How exciting for her, she has so many opportunities ahead of her! I wish her much luck and prosperity. It has been a pleasure to work with Courtney for all her custom prom jewelry and custom ball jewelry. 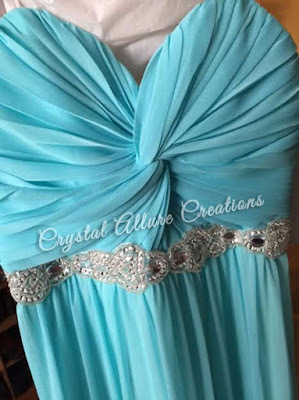 In her final Senior Ball 2015, she chose a full-length, strapless aqua City Triangles prom dress with ruched bust and beading detail at the waist. This dress posed a slight challenge in that it really only had one (1) crystal in the design and, it was a very difficult color to match. Courtney also provided some, much appreciated, feedback on her past prom jewelry designs and how they worked for her. For this new custom prom jewelry she requested a slightly lighter weight earring. She told me that the previous earrings, for her, were a little 'heavy' when she was trying to dance (which involved jumping up and down). I would have to agree with her. Some Swarovski crystals can feel 'heavy', especially when grouped together, and for those with sensitive ears. I know this from experience and when you pair sensitive ears with earrings that feel 'heavy', it doesn't make for a great night. We decided to make the necklace stand out a bit more with either a 2 -or 3 strand design. Also, the earrings would be kept super simple which would lend them to be more comfortable with her sensitive ears. 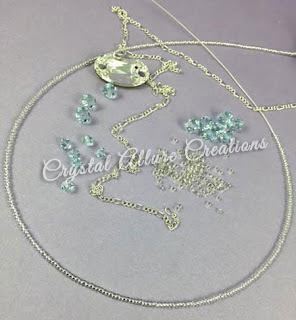 Courtney's mom, Dawn, requested a coordinating crystal anklet, as well. 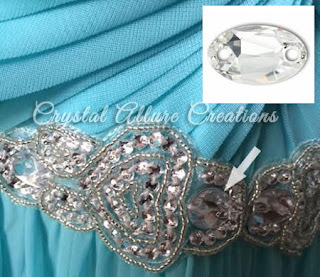 To start this design process, I began looking for a similar crystal cut that would match or come close to the one in her prom dress. It was oval in shape and was actually a sew-on crystal because it had openings on both ends of the crystal. I found just the crystal to meet this need. It was a Swarovski Elements owlet sew-on rhinestone crystal. It's a beautiful bead that although sewn onto the prom dress, I will be using as a pendant to Courtney's custom prom necklace. The remaining detail in the dress showed a heart-shape along with silver-lined seed beads and sequins. Luckily Courtney lived close by because I decided to meet with her to try and find a matching or coordinating blue crystal. 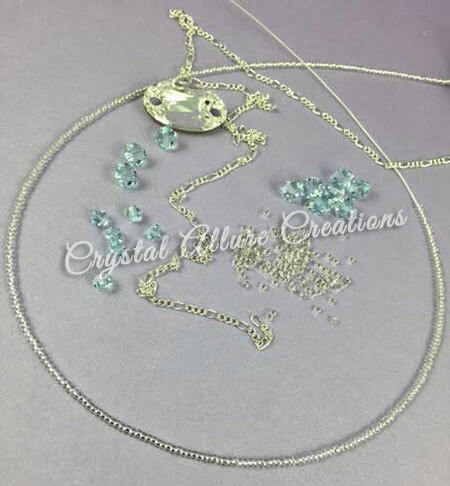 I was surprised to find that out of the nearly 26 different shades of blue Swarovski Crystals, only 1 stood out. That color was light azore. Shown above is a foiled, owlet sew-one Swarovski Elements crystal, light azore Swarovski Crystals, silver cable chain and silver-lined glass seed beads strung on beading wire. Now that I had all the elements I needed and a few design ideas, I got to work. Courtney attended her Senior Ball in May 2015 and her pictures, showcasing her custom prom jewelry, will be added to the prom album soon. Subscribe to the E-Newsletter and you will be notified by email when those pictures are posted.